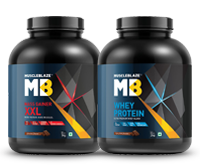 The MuscleBlaze Raw Whey Protein 8.8 lb Unflavoured sets a higher benchmark of performance for other protein supplements. Each serving (30g) of this raw whey protein aids to provide every fitness enthusiasts unsweetened whey protein concentrate. Due to the neutral tasting composition, it helps to provide the fitness enthusiast with the flexibility to add flavors as per their choice. 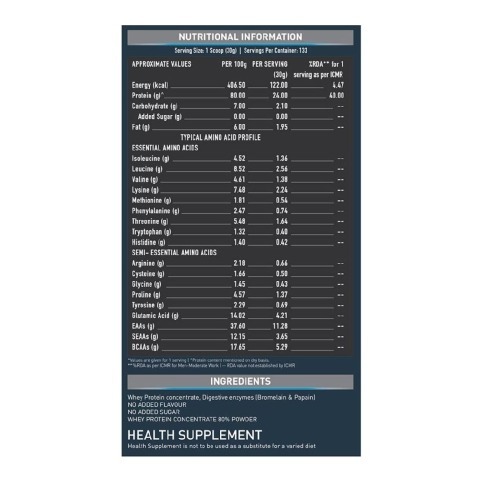 Each pack of MuscleBlaze Raw Whey Protein 2.2 lb goes through several tests to guarantee 80% protein content per serving. The primary source of protein in MuscleBlaze Raw Whey Protein 2.2 lb is whey concentrate, 80% pure protein by weight. 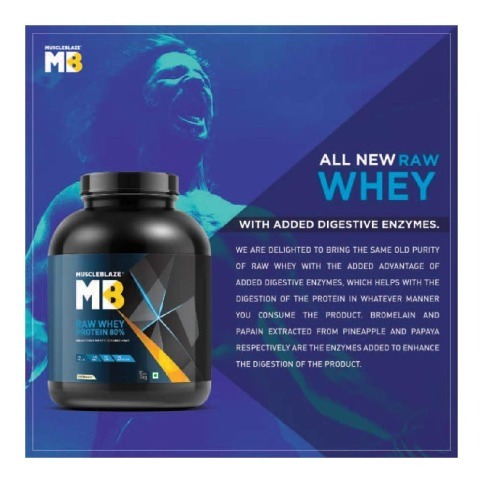 Each serving of MuscleBlaze Raw Whey Protein helps to provide 24g of proteins along with whey concentrate, which helps to trigger new muscle synthesis and aid in immediate recovery after strenuous workout sessions. 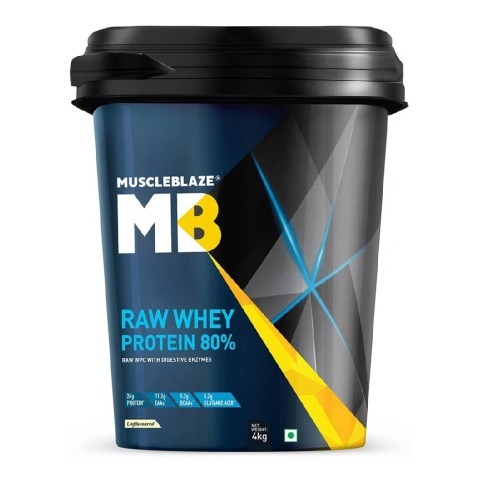 MuscleBlaze Whey Protein 2.2 lb Unflavoured comes with a comprehensive amino acid profile, which comes with the benefits of 10.8g of Essential Amino Acids and 5.2g of Branched Chain Amino Acids in each serving. 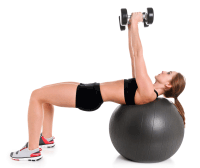 It aids in reducing muscle soreness when consumed before and after a workout. 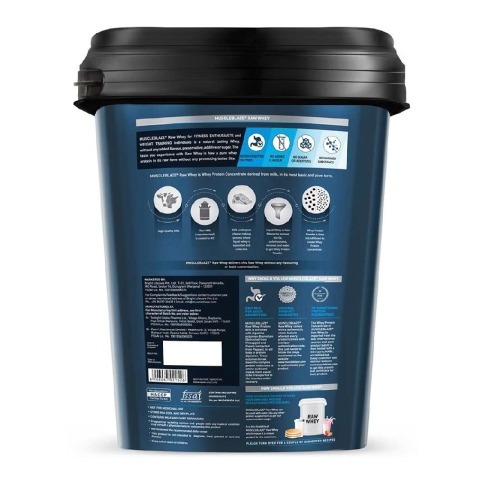 The potent BCAAs include leucine, isoleucine, and valine, which helps to reduce fatigue, enhance muscular strength and rapid muscle recovery after rigorous workout sessions. Add 1 heaping scoop (30g) to 190-210ml of cold water/skimmed milk/any other liquid of your choice. Blend for 45-60 seconds for a thick and creamy shake. Take 1-2 Whey Protein Powder per day or as recommended by a nutritionist to build lean muscle mass. 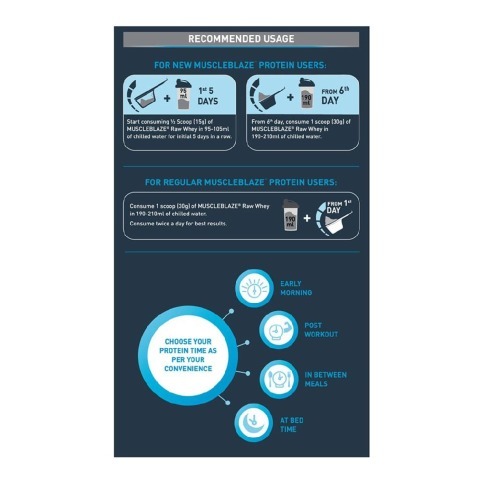 How is MuscleBlaze Raw Whey Protein 80% different from MuscleBlaze™ Whey Protein? 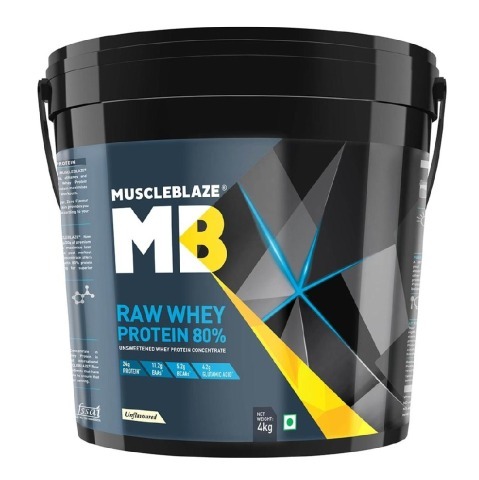 MuscleBlaze Raw Whey Protein contains 80 percent pure whey protein concentrate in each serving. 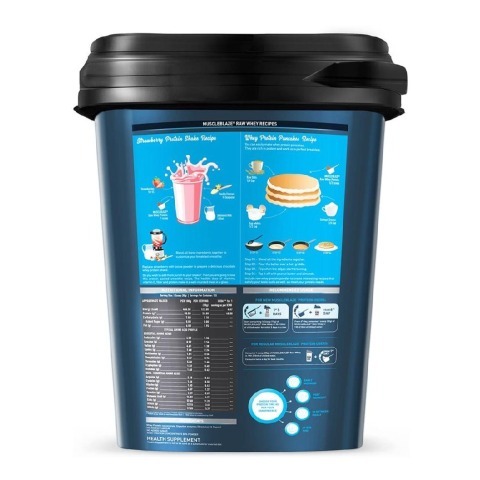 A 30g scoop delivers 24g whey protein concentrate, 10.8g Essential Amino Acids (a type of amino acids that the body is not able to synthesize) 5.2g Branched Chain Amino Acids and 4.2g Glutamic Acid. 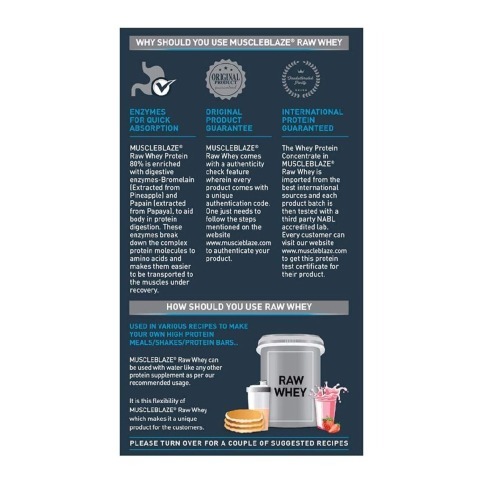 Raw Whey Protein has no flavour, sugar and can be easily used as the base for differently flavoured whey protein shakes. MuscleBlaze Whey Protein comes with DigeZyme, a multi-enzyme digestive blend. 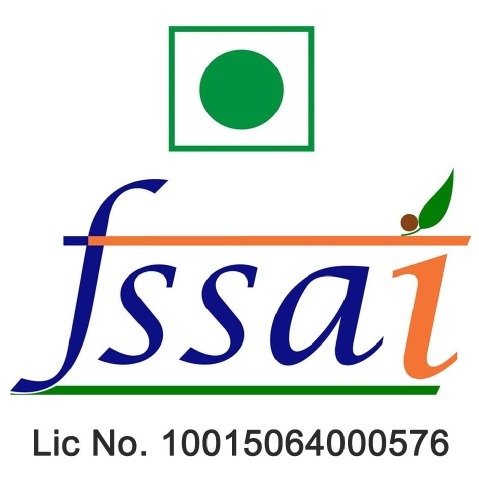 The primary source of protein is whey protein concentrate and it metabolises quickly in the body. The added DigeZyme improves the digestion and absorption rate of the protein. 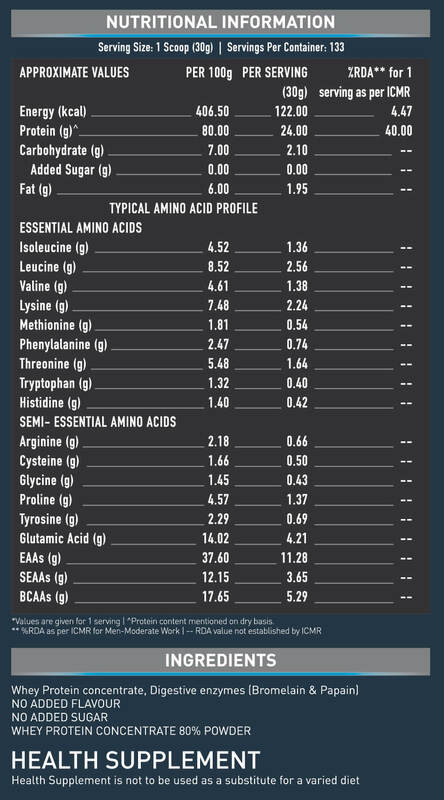 Hence, you get more value for the money spent as you are able to absorb each bit of the amino acids. 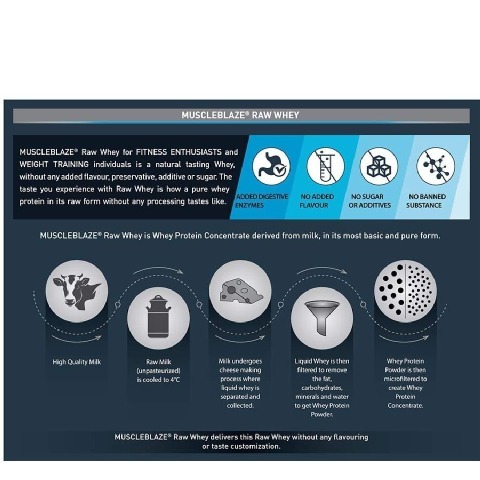 What are the benefits of unflavoured MuscleBlaze™ Raw Whey Protein? The biggest benefit of MuscleBlaze Raw Whey Protein is flexibility. 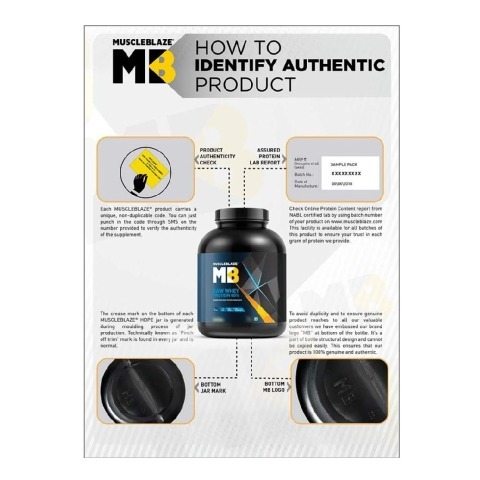 It gives the muscle seeker and athlete the freedom to prepare whey protein shake of his choice. How to use MuscleBlaze Raw™ Whey Protein? All you need is to add one heaping scoop (30g) whey protein in 190ml – 210ml of cold water/skimmed milk. Blend well for 45 seconds. You can drink it before and after a workout. Drink it in the morning and at bedtime to prevent catabolism.